Enzymes are required for all living functions, including eating, breathing, and sleeping. The body produces its own enzymes to support these functions. As we age, the bodies’ ability to produce sufficient levels of enzymes to maintain optimal health significantly decreases. Insufficient levels of enzymes may lead to excess fibrin buildup, impurities in the cardiovascular system, fatigue, and other symptoms of chronic illness. 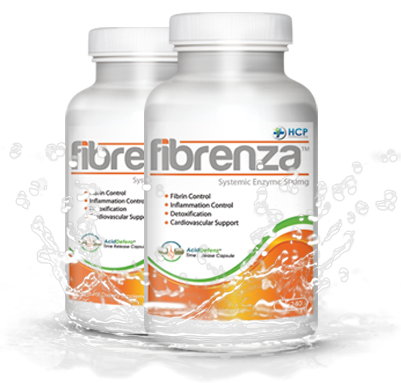 Fibrenza is an advanced blend of 14 powerful systemic enzymes that are specifically formulated to supplement the bodies’ ability to dissolve fibrin, cleanse the blood, detoxify the body, and maintain a healthy immune response. These functions are the cornerstones of many anti-aging regimens. 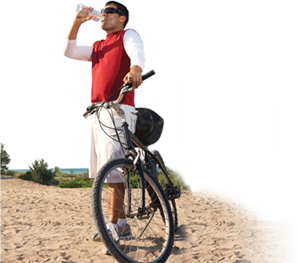 Seaprose-S® is a proteolytic (protein eating) enzyme that has been shown in studies to be one of the strongest oral enzymes available today. 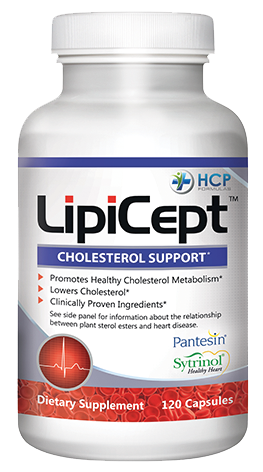 Serratiopeptidase (Serrapeptase), Trypsin, Chymotrypsin, Protease, Acid Stable Protease, Bromelain, Papain and Peptidase are proteolytic enzymes that break down proteins, toxins, and other cellular debris. 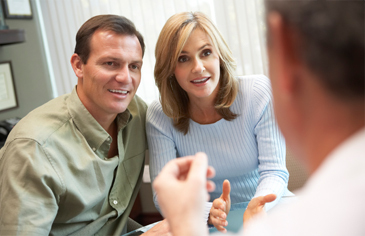 They are also widely used to limit the debilitating effects of excess fibrin formation. Superoxide Dismutase (SOD) is an enzyme that helps break down potentially harmful oxygen molecules in cells, which may prevent damage to tissues. A potent antioxidant, it is the foundation of anti-aging and detoxification protocols worldwide. 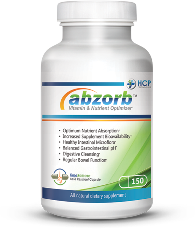 Abzorb utilizes a technologically advanced capsule to provide maximum protection against stomach acids without the use of phthalates or harmful chemicals and solvents. The acid-resistant capsule consists of a non-GMO vegetable cellulose barrier that allows for a timed release of the ingredients. 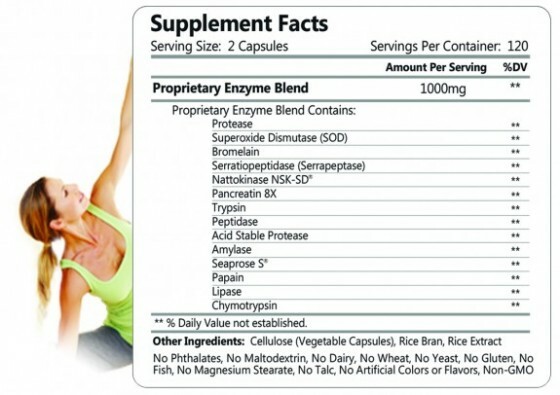 Unlike typical digestive enzyme supplements, the enzymes are protected for use in the intestinal tract rather than being primarily metabolized in the stomach. This allows for increased intestinal cleansing. Ozonated Magnesium Oxides (Elemental Magnesium) – The magnesium oxides have been ozonated and stabilized in order to release reactive oxygen species (ROS) during the digestive process. This release of ROS helps to cleanse the intestine of unwanted acidic debris and create of environment for healthy microflora colonization. 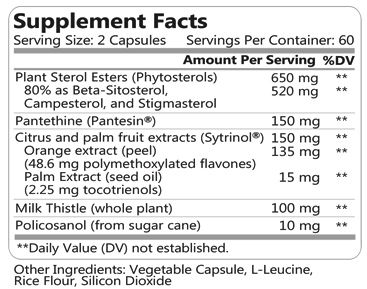 Suggested Use: Adults take 2 capsules once daily with water, preferably on an empty stomach. Your healthcare provider may also recommend an activation dosage of 2 capsules, twice daily for the first two weeks. Advanced Therapeutic Dosage: Take 2 capsules, twice daily for two weeks. Our products are available for same day pickup at more than 2500 professional offices and health food stores nationwide. Contact us today to find a provider near you or shop online at one of these fine retailers. 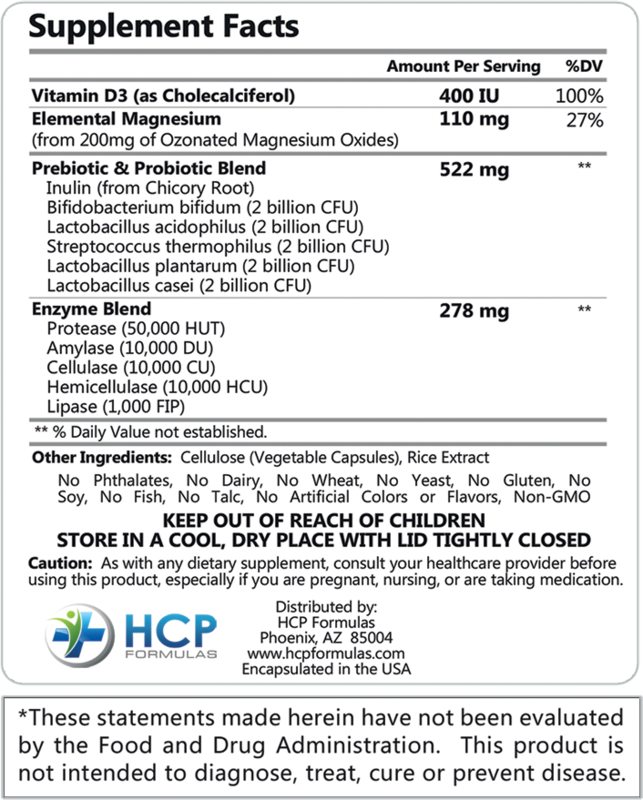 please email inquiries@hcpformulas.com or call (800) 710-2585.